October 29, 2013 - U.S. scheduled passenger airlines employed 380,564 workers in August 2013, 2.2 percent fewer than in August 2012, the U.S. Department of Transportation’s Bureau of Transportation Statistics (BTS) reported. August was the 12th consecutive month that full-time equivalent (FTE) employment for U.S. scheduled passenger carriers was below that of the same month of the previous year. BTS, a part of the Department’s Research and Innovative Technology Administration, reported that the August 2013 FTE total for scheduled passenger carriers was 8,436 fewer than in August 2012. Scheduled passenger airline categories include network, low-cost, regional and other airlines. The 2.2 percent decline in FTEs in August 2013 from August 2012 may be due, in part, to two factors. First, American Airlines, the industry’s third largest employer, filed for bankruptcy in November 2011 and reduced FTEs by 7.2 percent year-to-year. Second, network carriers have experienced increased fuel costs and have reduced contracts with the regional airlines that operate less fuel-efficient regional jets. Regional airline employment is down 5.1 percent year-to-year. The five network airlines that collectively employ two-thirds of the scheduled passenger airline FTEs reported 2.5 percent fewer FTEs in August 2013 than in August 2012, the 13th consecutive month with a decline from the same month of the previous year. Delta Air Lines reduced FTEs by 4.2 percent from August 2012 and American Airlines by 7.2 percent. United Airlines reported 0.2 percent more FTEs, while US Airways increased FTEs by 2.8 percent and Alaska Airlines by 3.1 percent from August 2012. Network airlines operate a significant portion of flights using at least one hub where connections are made for flights to down-line destinations or spoke cities. Of the six low-cost carriers, three - Spirit Airlines, Allegiant Airlines and JetBlue Airways - reported an increase in FTEs from August 2012 while three - Frontier Airlines, Southwest Airlines and Virgin America - reported a decline. Low-cost airlines operate under a low-cost business model, with infrastructure and aircraft operating costs below the overall industry average. Among the 13 regional carriers, nine carriers reported reduced employment levels in August compared to the previous year: Endeavor Airlines, Chautauqua Airlines, Air Wisconsin, Horizon Airlines, ExpressJet Airlines, Mesa Airlines, PSA Airlines, SkyWest Airlines and Compass Airlines. Regional carriers typically provide service from small cities, using primarily regional jets to support the network carriers’ hub and spoke systems. Carrier Groups: The five network airlines employed 67.3 percent of the total number of FTEs employed by all scheduled passenger airlines in August, the six low-cost carriers employed 18.2 percent and the 13 regional carriers employed 13.0 percent. The three airlines with the most FTEs in August – United, Delta and American – employed 56.6 percent of the month’s total passenger airline FTEs. These three airlines carried 40.6 percent of total passengers traveling on U.S. airlines in August, the most recent month available. Top employers by group: United employed the most FTEs (82,082) in August among the network airlines, Southwest employed the most FTEs (45,000) among low-cost airlines, and American Eagle Airlines employed the most FTEs (11,138) among regional airlines. 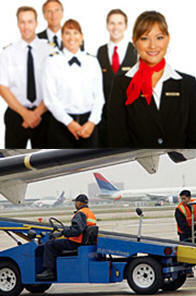 Four of the top five employers in the industry are network airlines. Recent Changes: The network airlines employed 6,628 fewer FTEs in August 2013 than in August 2012, a 2.5 percent decrease. Three of the five network carriers reported an FTE increase from August 2012 to August 2013. Five-Year Changes: The network airlines employed 2,769 fewer FTEs in August 2013 than in August 2009, a 1.1 percent decrease. American reported the only percentage decline in FTE employment from 2009 to 2013, 12.8 percent. US Airways reported an increase of 1.8 percent. August 2009 and August 2013 numbers for United and Delta are not directly comparable because of the intervening mergers. United reported 3.3 percent more FTEs in August 2013 than United and Continental reported separately in August 2009. Delta reported 3.7 percent more FTEs in August 2013 than Delta and Northwest reported separately in August 2009. Recent Changes: The six low-cost airlines reported virtually no change as a group in FTEs from August 2012 to August 2013. Frontier, Southwest and Virgin America reported year-to-year decreases while the remaining three airlines reported increases. Five-Year Changes: The low-cost carriers employed 6,588 more FTEs in August 2013 than in August 2009, a 10.5 percent increase. Spirit reported the largest percentage increase, 19.9 percent, while Frontier reported a 12.5 percent decline. August 2013 numbers for Southwest are not directly comparable to 2009 because of the intervening merger. Southwest reported 5.4 percent more FTEs in August 2013 than Southwest and AirTran reported separately in August 2009. Recent Changes: Regional airlines reported a 5.1 percent decrease in FTE employment in August 2013 compared to August 2012; three regional airlines discontinued service since a year ago. Republic Airlines and American Eagle reported the largest percentage increases in FTEs from August 2012 to August 2013. Endeavor and Chautauqua reported the largest percentage decreases. Five-Year Changes: The 13 regional carriers operating in August employed 12.1 percent fewer FTEs in 2013 than the 18 carriers operating in August 2009. Endeavor reported the largest percentage decline followed by Mesa. The ExpressJet/Atlantic Southeast combination reported 1.7 percent more FTE’s in August 2013 as the two airlines reported separately in August 2009. GoJet reported the biggest four-year percentage gain. Endeavor operated as Pinnacle prior to August 2013. Airlines that operate at least one aircraft that has more than 60 seats or the capacity to carry a payload of passengers, cargo and fuel weighing more than 18,000 pounds must report monthly employment statistics. The “Other Carrier” category generally reflects those airlines that operate within specific niche markets such as Hawaiian Airlines and Island Air Hawaii serving the Hawaiian Islands.